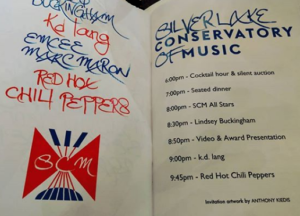 Last night, 29th September, Anthony Kiedis performed with the Red Hot Chili Peppers as part of the 2018 Silverlake Conservatory of Music Fundraiser honouring Mo Ostin. NOTE: Sorry, I am got going to download and copy (without credit) personal stories from Instagram as some other pages do as I assume personal stories are well, personal and I’m currently waiting to see if I get permission to use a friend’s photos who was at the event but I will link to public posts as being public implies it’s OK (will always link to the original and then the poster has the option of changing settings if they wish). Here are a few things from Instagram (there are a lot more in personal stories if you search for relevant tags). Will update when appropriate. 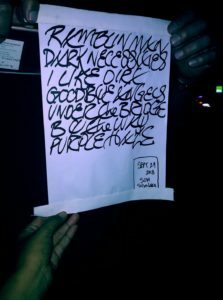 This entry was posted in Anthony Kiedis, Red Hot Chili Peppers, RHCP. Bookmark the permalink.